Morning, Monday, morning, ALL! How was your weekend? Mine was one of the most cathartic I've had in a very long time; in no small part thanks to speaking and listening at the Dream It Do It motivational talk held in Airfield by Nicola & Fiona. There's a lot of things of late seem to be going very, very right & not once have I had a let down that the very next day saw something better lift my spirits again. I'm not doing #BLESSED - I'm not! I am looking forward to a week of Dublin sunshine & giving thanks for these five Moments though, ready? 1. I spoke last week on Snapchat about my experience with post natal depression and again candidly at the #didi talks on Saturday. Both times I had messages returned thanking me for being so open about it. There's no feeling in the world like being told you've helped just by telling your story, something that feels like the most natural thing in the world. 2. Speaking of speaking at Dream it Do it, both Corrina & I took to the stage, which was such good fun. Even better than that? We brought Mum along to spend the afternoon with us and hear us speak. Truly, there's nothing more leveling than seeing your Mum tear up watching you and your sister talk, or joining in to give her perspective on some of the most challenging times we've had. We wouldn't be us if it weren't for her and I can't tell you what it means to have her with me every step of the way. 4. Corrina giving me an early birthday gift - tickets to London Town!! We're heading at the end of April & still on the hunt for decent, central accommodation. If you've any recommendations - holler at me! 5. Being commissioned to write for Newstalk! Following on from my chat with Pat Kenny about monetising your blog, I've been asked to contribute as a writer. I'm over the moon to be asked and already getting stuck in! Tell us, what are you grateful for this week? 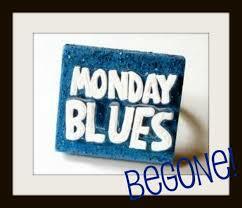 What Moments mean you're free & clear of Monday blues this week? Irish Passports ~ The Definitive Guide! Amsterdam & Eindhoven ~ What, Where, Why & How!